Terrorist militants affiliated with the Taliban in Afghanistan have been purchasing U.S.-supplied weapons and ammunition from Afghan army and police forces, which receive their funding from American taxpayers, according to a new government report. 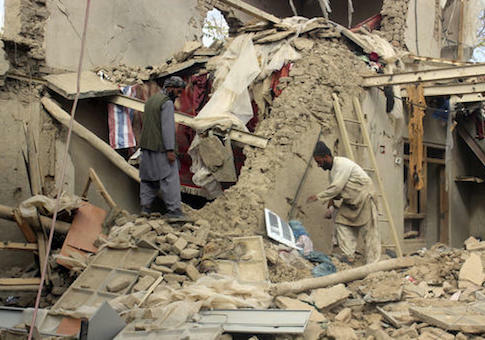 The disclosure comes amid an increase in violence in the war-torn country, where the Taliban continues to grow and regain territory once held by U.S.-allied Afghan forces. Just 63 percent of Afghanistan is under allied control, despite a four-billion dollar investment from the United States in 2016. With the country facing some of the highest levels of corruption worldwide, U.S. government inspectors have discovered evidence that the U.S.-funded Afghan security forces are selling their American-supplied weapons to Taliban terrorists. These U.S.-aligned security forces also have been stealing American-bought fuel and selling it to Afghan insurgents, according to new findings by the Special Inspector General for Afghanistan Reconstruction, or SIGAR. "The theft of fuel not only robs U.S. taxpayers and damages the reconstruction effort, but stolen fuel and profits from selling it can wind up in the hands of insurgents," according to a new SIGAR report authored to inform the new Congress and incoming Trump administration. "SIGAR has been told that a high percentage of fuel has been stolen and that Taliban commanders give instructions to their forces to buy weapons, ammunition, and fuel from the Afghan army and police," inspectors found. "A significant portion—perhaps as much as half—of U.S. purchased fuel is siphoned off at various stages of this compromised system, wasting U.S. taxpayer dollars and handicapping Afghan security forces," according to SIGAR. The Taliban is reaping a cash windfall from this scam and its opium operation, which has reached its highest levels ever in Afghanistan, according to SIGAR. John Sopko, head of SIGAR, disclosed in remarks earlier this week that the Taliban has become part of the U.S.-funded supply chain in Afghanistan. "There is evidence that the Taliban have instructed their field commanders to simply purchase U.S. supplied weapons, fuel, and ammunition from the Afghan government because it is both easier and less expensive for the insurgents to do so," Sopko said on Wednesday. "It's nice to know the Taliban are now part of our supply chain." One U.S. official familiar with the sale of weapons told the Washington Free Beacon that this has been happening for quite some time in Afghanistan. Officials working in the U.S. embassy and other military offices all have confirmed that the Taliban is purchasing U.S. weapons and siphoning off large amounts of fuel, explained the source, who was not authorized to speak on record. Another primary concern is the existence of so-called "ghost soldiers," or Afghan forces who are paid by the United States, but do not actually exist. "Afghan soldiers often pocket the paychecks of ghost soldiers, for whom the U.S. is paying the salary," according to Sopko and SIGAR's latest report. "The number of ghost soldiers is not insignificant. It likely reaches into the tens of thousands of soldiers and police." Afghan security forces are not capable of defending the country or stopping the Taliban, SIGAR found, despite massive investment by the United States, which constitutes one of the largest expenditures in American history. "These forces have not yet been capable of securing all of Afghanistan and have lost territory to the insurgency," according to SIGAR. As of August 2016, just 63 percent of Afghanistan was controlled by the government, down from 72 percent in November 2015. The United States is expected to invest another five to six billion dollars in Afghanistan through 2020, raising concerns about continued corruption and interference by the Taliban, according to Sopko. This entry was posted in National Security and tagged Afghanistan, Taliban. Bookmark the permalink.